If you are trying to use a TV remote/IR remote control, the sensor can have issues if the control is shining directly at the IR sensor. I have this sensor. It's nice and does indeed have a pretty good range of several feet (I've reliably gotten 3-4 ft). There are 2 caveats. At short distances (<4-5 inches), the output goes low, and then when it gets within range, it goes high....then it gradually decreases as the distance increases. This means that there is a sort of discontinuity between 3-5inches and 5+ inches. The second issue is that the values greatly based on the object in front and angle (ideally you need a reflective hard white surface facing straight-on). This just makes it a little hard to calibrate for some applications. Overall, MUCH better than the ultrasonic ping sensors, and way better than trying to build your own IR/Phototransistor pair. Image on the left is taken with a web camera and the image on the right is scanned with this Sharp Sensor (over the course of about 5 minutes). Used a single 0.1uF capacitor for signal filtering. The noise in the image comes primarily from cheap wobbly servos. I completely agree that the project is really cool, and Jade's result is awesome. Kudos! I'm going to venture a guess, but I could be wrong: closer objects (read "pixels") appear whiter, and more distant objects appear darker (and possibly smaller). You can use pretty basic trigonometry to get the x,y position of a pixel based on the angle of the servos and the distance measured. I've actually been working on a similar project, except my sensor is mounted on a multi-chassis (tank version), and sweeps only horizontally, for reasons of speed (5 minutes for a full picture isn't practical for a vehicle application). I have multiple settings to control the resolution and speed of the sweep. That way, when the vehicle is stationary, the IR sensor can do a wide-angle slow sweep â taking a reading for every degree across a 180 degree arc; when the vehicle is moving, the IR sensor does a narrow-angle fast sweep â taking a reading every 15 degrees across a 60 degree arc. This looked really good when I drew it in Processing. I'm faking a 3D representation (the data is only 2D) by changing not only the darkness but also the height of each individual data point based on the distance, which simulates perspective. All objects ahead of the vehicle look like walls, essentially. My next step has been to implement iPhone remote-control using Bluetooth. The readings are currently being sent to my iPhone (using RedBearLab's BLE Shield), but I have not yet implemented the graphical representation in the app. Your images no longer work. ImageShack just redirects to a page where it plays an unconvincing ad for itself. I suggest re-uploading to imgur; it's very reliable and reputable, and it has a much better user experience than I remember ever getting from ImageShack. Ah, just wanted to mention this since I didn't see it here. For those looking for a quick and relatively simple way to estimate the relationship between voltage output and distance. Take the readings on the graph from the datasheet or get them from your sensor (multiply the raw output readings by 5volts and divide by 1024 to get the result in volts. slightly longer but more likely to fit your sensor). Thank you - this worked out very well for me! Distance = 16.2537 * x^4 - 129.893 * x^3 + 382.268 * x^2 - 512.611 * x + 306.439 *Where x=Voltage read on ADC and Distance is in cm. Do you have perhaps a second degree approximation for the inverse of the output? 11 months later, but a common thing to do in this case is to use a lookup table, you can even initialized such lookup tables on boot, but for this particular application, its probably easier to just code it in. First, for high order polynomials you should factor them like so: d = 306.439 + x * ( -512.611 + x * ( 382.268 + x * (-129.893 + x * 16.2537) ) ) The original equation had (ax^4 = axxx*x) 4+3+2+1 = 10 multiplications and 4 additions/subtractions. Factored equation has 4 multiplications and 4 additions/subtractions. Second, I don't know how you're planning on running this at 50 Hz since the expected response time, based on the datasheet, is 38.3 ms (or ~26 Hz update frequency). I'm running 4 on the same Arduino Fio, at around 13 Hz each, but thanks for your help anyway. The factorisation trick will come in handy. I don't, but I've used the second plot from the data sheet (output voltage vs inverse of distance), called it a straight line from 30cm to 150cm, and a different straight line from 20cm to 30cm. Then it is easy enough to come up with two equations calculating distance from voltage. Advice for the power supply * In order to stabilize power supply line, we recommend to insert a by-pass capacitor of 10Î¼F or more between Vcc and GND near this product. 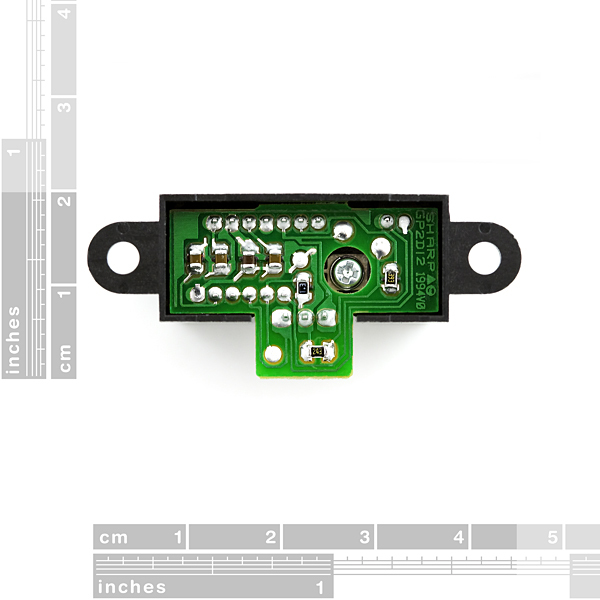 So I have been trying to use this sensor, along with an Arduino Mega, to help control a robot and its direction (i.e. turn it around should it be about to hit a wall), and I have basically no idea what I'm doing when it comes to coding it. I have it all wired and the coding for the rest of the robot ready to receive the coding for the sensor, but how do I make the mega interpret the raw data from the sensor and turn it into a distance number? does anyone know any websites that could help me with this or any tutorials online? Here is my calibration for the sensor in inches. Hello Everyone, I am new to this sensor. I am aware of how distance is measured. Can someone tell me how I can determine the angle of incidence ? Great rangefinder with a solid 5-foot range. Range values may vary for different colored surfaces, making it difficult to tell the difference between a close-up IR-absorbing object or a far-away IR-reflecting object. In our experience, this difference was only a few inches. I would recommend making an Excel (or equivalent) spreadsheet of experimental ADC values vs distances and using the software to create a trend line with a corresponding equation for your software to use to estimate ranges. Runs well on a regulated 5V supply with a good-sized capacitor to counteract the ripple it will cause when it pulls current. Hi I have one question i want to do this with ultrasonic sensor. The range of detection objects is 35-200cm, how to make from distance to picture. Did you make some scale for an example 35cm it will be white and 200cm will be black? If you have some advices pls write me i am new with this and i want to learn. Thank you in advance! Can this sensor pass through transparent or translucent material? If no, is there any alternate distance sensor that can be used with Arduino? Thanks! Can you PLEASE sell MORE kinds of these (especially the LONGER range ones)? anyone know when these will be back in stock?? Can anyone hazard a guess as to this thing's beam width and pattern? I'm looking to augment an ultrasonic rangefinder (EZ-1) for closer ranges (like 75cm - 150cm); i'm hoping this things beam is narrower than the EZ-1, or i can get away with constraining it with a black tube. Infrared tends to be pretty narrow because any wide angles would cause bad data. However, it all depends on the application. Reading the datasheet suggests that you need to protect the sensor when in certain types of lighting scenarios (outside in sunlight is an example they give). In regards to using a tube around it... It all depends on the tube. How is the tube mounted, how long is it, how big is the diameter of the tube, etc. I have used predecessors of this sensor before, and they do pretty well, however not every sensor meets the curve outlined in the datasheet. So it is best to do calibration tests on all infrared sensors to map out the range and sensitivity. the datasheet says nothing about beam width, but yeah, i will experiment, it's easy enough. IR LEDs vary in beam width, a lot, generally speaking. i posted cuz i was wondering if anyone else had done these sorts of experiments. no problemo here. thanks. I've done a couple of simple tests with a 4mm square balsa wood stick at ~30cm from the sensor. I shall refer to the data sheet for orientation description - so that the emitter is to the left or right of the detector (as opposed to above or below). When the stick was oriented vertically, and passed from one side to the other, it seemed to have a 2.5 degree detection beam. When the stick was also oriented horizontally, and passed from below to above (or vice-versa), it appeared to have a 3.0 degree detection beam. I hope this helps. 'hope this helps'? lol hell yes! thanks a ton, man/ma'm! that's exactly what i needed. very, very helpful. Hey Everyone, I am new to this type of sensor, I am using a 10kohm resistor between the pin back to my MIDItron. Does anyone know if I should connect the sensor without the 10kohm resistor? Also if anyone has any tips or hints on the codes using Max6/jitt I would greatly appreciate it. Thanks! I am experiencing erratic behavior with my sensor ? Also it seems to be heating up alot when it is running is that normal? basically I a not getting the results I want from this page ? http://arduinomega.blogspot.com/2011/05/infrared-long-range-sensor-gift-of.html Does it may a difference that I am using arduino uno instead I would really like to get this working ? I can provide pics and wiring to help ? What type of capacitor would you use for this? Would a 0.1uF (https://www.sparkfun.com/products/8375) cut it? 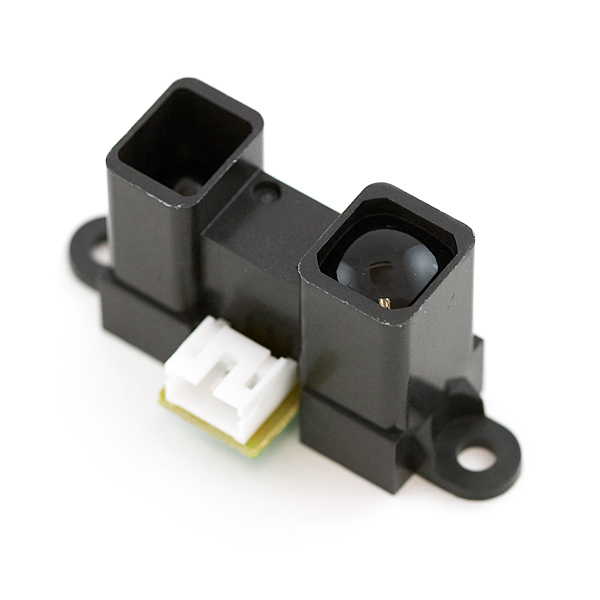 Does anyone know if the infrared proximity sensors can detect distance from behind glass? I did some tinkering with this, and from what I figured it would only work behind glass, if its pressed right against it, leaving no gap between the sensor and the glass. The datasheet is clear it's not 15cm it's 20cm. mine does 15 cm! thereafter the analogeRead-value gets smaller again. can I use this one to determine a waterlevel? so fixing it in my watertank with its beam downwards. or does water not reflex enough to give a distance?? is one to determine a waterlevel? so fixing it in my watertank with its beam downwards. or does water not reflex enough to give a distance?? I'm thinking to use a IR sensor to measure water level in a bathtub. Does it works? I dont want to use a pingpong ball. just the water. I have read it could work with hot water. It sometimes works with just water. I bought an other ultrasonic (way more expensive) sensor to measure the water level. Just try it! how to installl this on the arducopter? Surprised at how little information this data sheet has. Even plain old LED spreadsheets usually have a Radiation pattern. 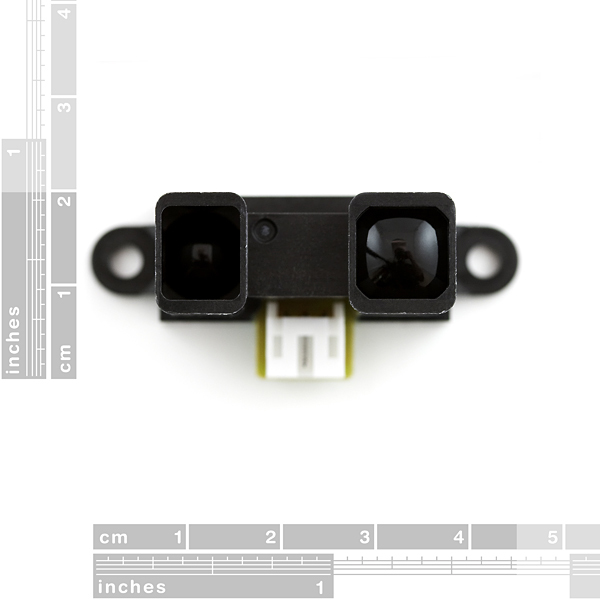 This sensor's case has relatively low resistance (150 Ohms), be careful when mounting on other conductors. what is the angle range of this sensor? very nice sensor. much easier to use than a ping sensor but does not have as much range. It is perfect though for my application. Is my thinking incorrect? or my math? Does anyone know how these react to different color? Say I have a white board at 2 ft and take a reading (discard first, average 4), then switch to a red, green or blue board at the same distance and take another reading the same way. Will I get the same reading both/all times or even something close? Sounds like you've got an experiment to do! Yup, I should get one soon then. I have the other style ones (GP2D120's), so I might try it with that tonight. I was wondering if anyone can help me with my problem. I bought this sensor hoping for it to track the distance my hand is away from it, which it does. However, the numbers corresponding to the distance fluctuate very quickly despite how I hold my hand still. Is this normal? I plan to use these numbers as a way to control which sounds I play. However, if the numbers fluctuate so much it won't work. I'm using an Arduino Uno and Max MSP for my project. I apologize if this isn't the place to ask this question but hopefully someone here can help me. Thanks. Make sure your power supply is clean and filter it with capacitors if necessary. Putting a 0.1 uF ceramic capacitor on the IR sensor output may also smooth out some of the signal. That example takes a sensor reading and puts it in bufferC the first time. Second time the loop runs, that value passes to bufferB and third time to bufferA. Essentially, you get to keep the last 3 readings that you can then average to get a smooth output. By increasing the number of samples or the delay you can increase smoothing at the expense of latency. Can we use glass case to protect this sensor from weather? Would it be ideal for car backup monitor? the ultrasonic ones arent weather proof and putting a glass case will void the range finding. Glass case can be used for protection, provided it is flat and clear, not refracting or scattering light. Don't use plexiglass as it reduces or completely blocks the infrared light. Regarding the main question, this would be a very bad choice for car backup monitor as it performs poorly in sunlight or under any light containing infrared spectrum. It's best suited for indoor use. Most car sensors are ultrasonic. I use this one for outdoors which has some weatherproofing http://www.sparkfun.com/products/9496. It is pricey and if you do get dirt into it, it'll be absolutely impossible to clean. In your case I'd go with a cheap Maxsonar EZ series sensor, putting a PVC pipe extender onto it for weatherproofing. The longer the barrel, the less chances of something getting into it. Another issue with IR sensors is that they project a dot and are only able to detect what's directly in front of them based on how well the dot is reflected. If the object is black, shiny or textured you may get a bad reading. 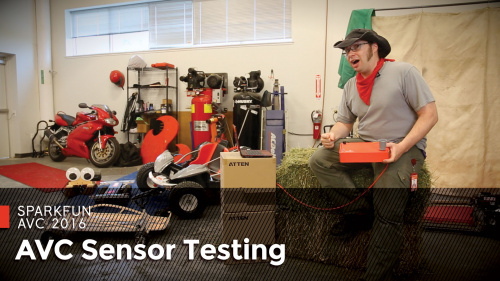 A sonic sensor is a lot harder to fool. In addition it emits a cone-shaped sound wave, so the detection radius is much wider. Will IR remote controller interfere with it? Short answer - yes. Depth perception will get affected by a small amount in presence of a foreign IR light source, but the remote is very unlikely to cause a major misreading unless you shine it right into the sensor or have it against the obstacle that it's scanning. 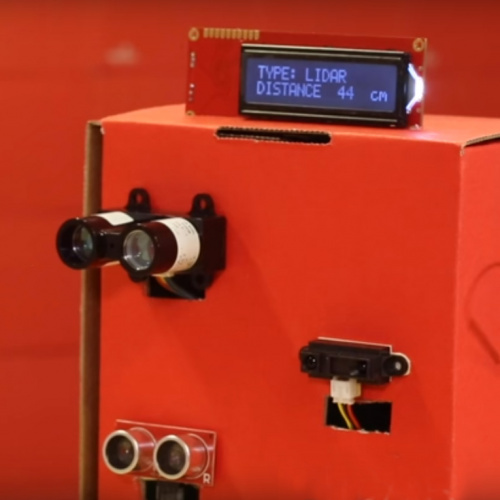 This device projects an infrared dot and triangulates the distance based on where it sees the reflection. The dot itself is not perfectly sharp, so the triangulation result gets affected by reflective quality of the obstacle on which it lands. A dot on a white surface will appear to be slightly closer than one on a black plane. The ambient light (including sunlight) containing infrared spectrum will also increase the perceived radius of the dot. Most IR remotes project a soft cone of light as oppose to a focused beam, so they won't cause much error in reading. A ray of sunlight, in comparison, will generate a measurement error 100x greater. The device is best suited for indoor applications with constant lighting containing the least amount of IR. To get the idea of what the sensor actually sees check out my post higher in the thread. Hey, all these sharp proximity sensors are obselete! I almost used them on a project. They work reasonably well and there doesn't appear to be any single-component replacement available. Get 'em while the getting is good. The connector is a bit strange. I unsoldered it and soldered on a few 90 degree male header pins. Had a chance to test these out today. Managed to reliably extract about 1/3 of the maximum stated range (60cm) off a 4.5 volt power supply. Increasing the voltage to 5.5v raised the max range all the way to the stated 1.5m. Much like with sonic sensors, the power supply affects the intensity of the dot/ping and the max detection range. However the input voltage does not change the min range cutoff, so if 15cm is too much for you, go with a mid or short range Sharp sensor. Overall, great value, fast response and negligibly low self-noise. Would it be possible to raise the item limit to 5? The robots I build tend to have an odd number of proximity sensors for symmetrical obstacle detection. There's a central sensor and a matching number for the left and right side. 3 sensors are enough for some setups, but for anything more complex (near/far side detection) or for motion tracking 4 just isn't enough. Last time I needed to track linear movement, I had to go with a thermopile array, just because I couldn't buy enough stand alone infrared detectors from Sparkfun. You know, Jade, I'd be willing to bet if you explained your situation to Sparkfun, they'd let you buy the extra sensor. They're reasonable folk. 20 feet is pushing IR. I think Sharp makes one for that range. Beyond 20 feet, you'll have to rely on LASER ranging ($$$). You might also try two parallel LASER beams and a TV camera, and try analyzing the number of pixels apart the two beam dots are, but that's only theoretical and may require LASER power that could be harmful to human (and animal) eyes. Do they make something like this that works up to 50 feet? I hooked this up to my Arduino, but I am not getting any input voltage. How should the wires be connected? Check the datasheet... One really fun gotcha of this component is that it needs two reads to really stabilize the data and get good information, but it will tell you the first read, meaning that if there is constant motion, or something JUST NOW stopped, your first read will be trash, and subsequent reads will actually have a basis in reality. Re the comments on the "gotcha" - this comment threw me off a bit. I interpreted it as meaning every other read would be garbage..but actually it's really just the very first read which (for me anyway) is no big deal. I take that back. The input voltage seems to be random, and not related to how far an object is. Just place a decoupling/bypass capacitor across Vcc and GND. 0.1uF will do. That will remove the noise that comes from the power supply lines. The datasheet says to use a 10uF capacitor. y = distance in inches. x = analog reading from sensor. The sensor works pretty good and buffering the values certainly helps with a more stable output. I'm buffering 10 values. I forgot to buy the 3 pin JST connectors with my sensors so placed an order for a bunch of 2, 3, 4, 6, & 8 pin PH connectors (male & female) from digikey. Sorry for multiple posts....The site is not compatible with Opera browser for posting comments. The analog signal from this sensor is working quite well with my Arduino. I use this sensor to indicate when I am at my desk. The desk is positioned such that my wife can't see me sitting there. The Arduino activates a "Christmas" star ornament positioned on the top of a hutch located on the desk. This sensor is replacing an incandescent thru beam sensor that has a history of burned out bulbs due to heat. This sensor has great range and was easy to setup. This sensor is really good for the range. The only thing I wish was different is that it had a closer range that still worked well. I'm not sure what would be involved in that, but it's a good IR sensor with good readings.